It's been awhile since I shared a Stitch Fix. January, to be exact. I got my fifth fix in March, but it was Spring Break, we had just moved, and I was sick, sick, sick. Not to mention, I forgot to change my address so it was shipped to our old house. By the time I got there to pick it up, I was already on day 2 of 3 and I had to decide quickly what to keep and what to send back. I kept one thing (a blue polka dot blouse with a split back), basically to not lose the $20 styling fee, but I would describe that fix as a dud. So much that I don't even remember the rest of it (and now I'm mad for not taking pictures). Anyway, in early May I decided it was time for another box! I signed up for the end of May and thought it'd be a perfect You-Made-It-Through-the-School-Year-Happy Summer-to-Myself gift. And then I made the mistake of going to Target a few days before my box was to be shipped. Since we don't live three blocks away anymore and I don't make it to Target often (and I was there by myself), let's just say I was in Target heaven. And of course, they had racks and racks of clearance clothing and a whole clothing department full of other cutesy summery stuff. I left with a handful of tops, a few pairs of shorts, and a pair of wedge heals. No big deal--I decided I'd go home and cancel my upcoming Stitch Fix. I tried to do just that the moment I got home, but of course, my fix was already "in progress" so I was unable to cancel it. Still not a big deal, I figured the box would be another dud and I wouldn't mind shipping four of the five items back. And then I got my box. And whatdoyouknow--it wasn't a dud. In fact, it was the opposite. I love everything. Literally, e v e r y t h i n g. Murphy's Law, right? A sleeveless, plaid top that could be worn casually with shorts this summer or as a nice work top with a pencil skirt this fall. I do like it, but after trying on the other items, this is probably my least favorite of the bunch. It has a bit of a maternity feel to it. I think if it was one size smaller, perhaps it wouldn't feel that way. It's also really long in the back. Like if looks as if I'm not wearing shorts/pants. So I like it, but it'll probably go back. 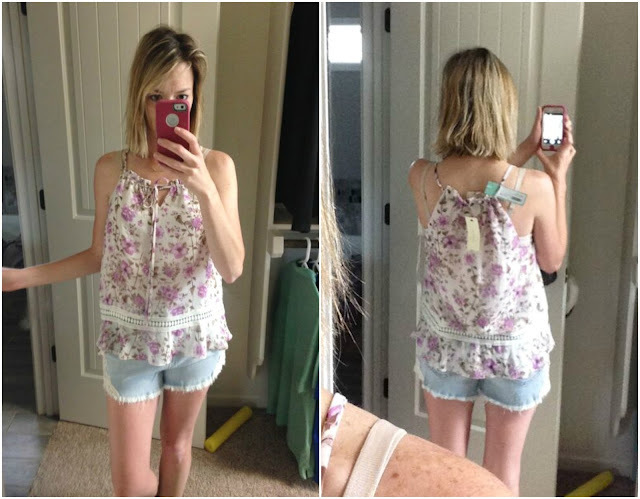 When I first signed up for Stitch Fix after seeing some cute pieces on Jana's blog, this is what I had envisioned. Adorable and unique things like this! Perhaps my all-time favorite item from Stitch Fix right here! I love everything about this - the fit, the stripes, the detail. Keeper, fo sho. Another all-time fave! I love the floral pattern and the fit. (Maybe it's just summer clothes that I love??) 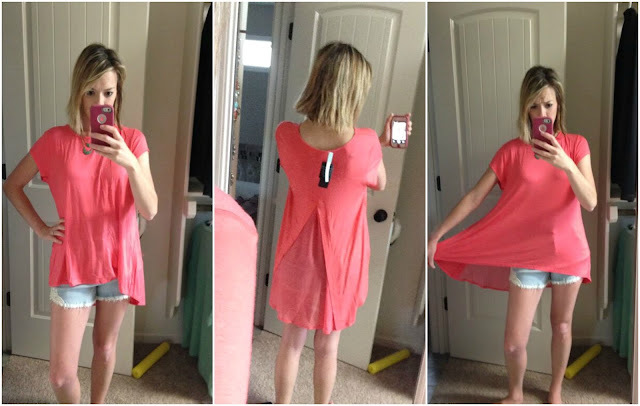 I have nothing bad to say about this top. It's adorbs. Another keeper. I really like the loose fit of this, and the color, and the look of it from the front, but the back?? I can't decide. It's super long and makes me look like I'm sans pants (again). I like it with these shorts, but perhaps it would be a good look with leggings. What do you think? Keeper or no? 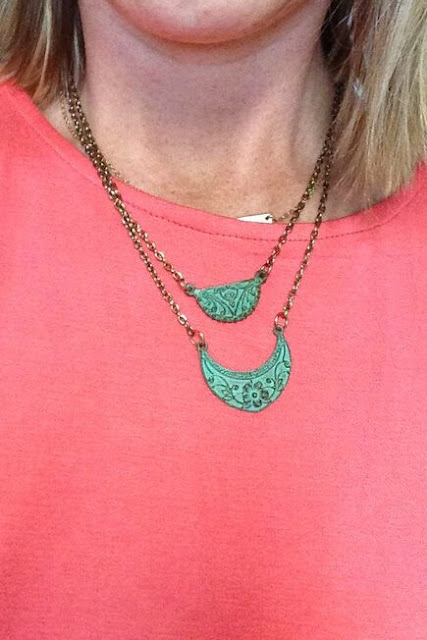 I'm a sucker for necklaces. Especially ones that are teal. So it goes without saying that I love this. But probably not as much as I love the tops? So it may get shipped back. If I keep everything, the cost would be $136 (because of the 25% off "buy all discount".) Not bad, really! But that's after already spending over $100 at Target the other day and I normally don't spend that amount of money on clothing in such a short amount of time. If I send back the plaid sleeveless and necklace, the total is $116 (seems silly). If I keep only my two favorite tops, it'd be $82. Ahhh I can't decide! Someone please tell me what to do! Seriously though--input? I'm definitely keeping the striped and floral tanks since they are my favorite items to date!! 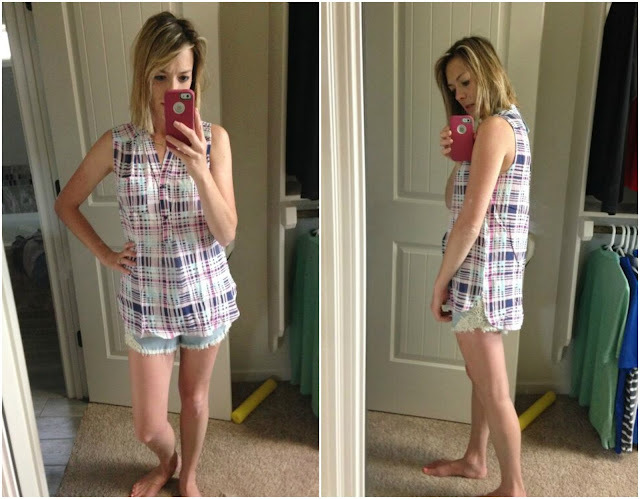 Interested in trying Stitch Fix? Use my referral link and help me earn SF credit! 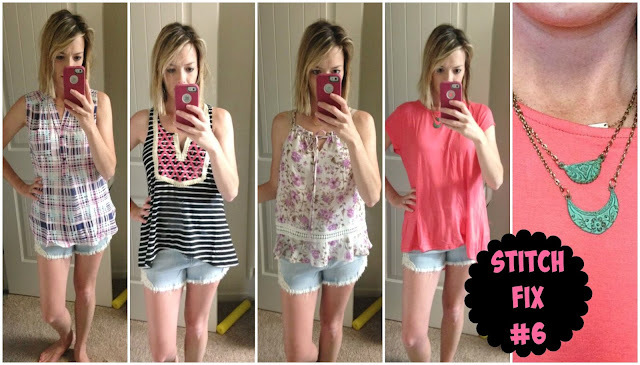 I've been DYING to try stitch fix, especially when I see all these cute things that everyone else gets! Does it really only cost $20 each box (plus what you decide to buy)? I always thought it was more (or maybe I just assumed I would want to keep everything and that's why it would cost so much lol). Keep. It. All! So adorable! Plus, it makes sense mathematically! 😉 it's also an anniversary present to yourself! Can you get that shirt a size smaller? Maybe then you'll feel better about it.